Martial arts are not about fighting they are about not fighting. The best fight is the one that does not occur. Often people training in the martial arts are only looking for an efficient way to injure somebody under the pretext of “self defense”. In the Bujinkan we focus much more on the Tactical defense vs self defense. A tactical defense will let you know the risks before you reach a situation where you will have to fight. The Bujinkan system is led by Sôke Hatsumi Masaaki in Japan and regroups 9 old martial systems (ryû) going back through the centuries to the early times of warfare in Japan. The main aspect of fighting developed in Japan during the Muromachi period that prceded the famous Edo period where warfare was not allowed anymore. Everything we know about the samurai and the ninja comes from this recent period of japanese history. What we practice in our dôjô took place a hundred years before the peace time. All modern Gendai Budô where created after the Edo period during the Meiji restauration (end of 19th century). They developed later into sport systems and are known today as the martial arts. But in relaity they are far away from the attitude of the martial ways of the old days. 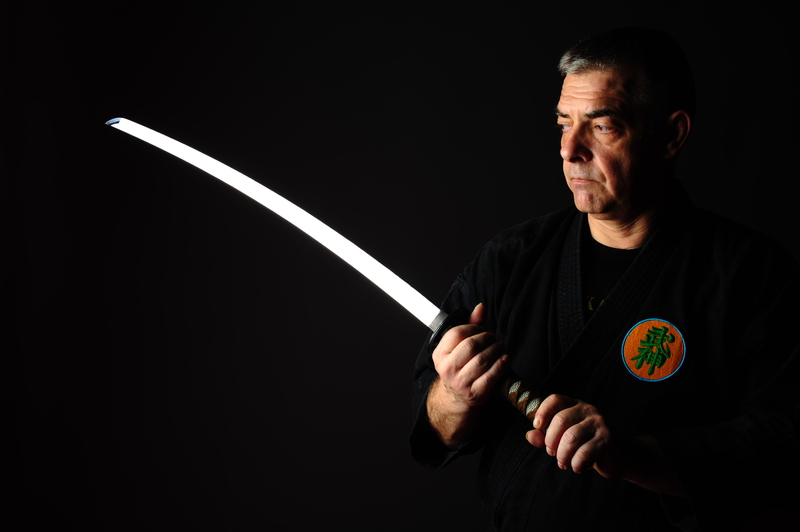 There is no judgement of value here simply the Bujinkan offers another way to look at Budô. I have training more than 40 years in “martial arts” including 26 years in the Bujinkan. Being a shihan of the Bujinkan I give seminars all over the world and travels three times to Japan to train under the Sôke. I will do my best to write here as often as possible and I hope that by sharing my experiences I will help other to find their own way. The name “Shiro Kuma” (polar bear), is a nickname given by Sôke back in 1986. Just found out about your new blog, looking foward to reading more of your particular insights into the Bujinkan … and the rest ! It is such a humbling feeling to recollect the fantastic learning I have had every time you have come to Bangalore, India. This blog further heightens my privilege of gaining knowledge from you. Thank you for the wonderful posts and the insights each writing brings with it. It has been my pleasure to participate at the Dojo Vincennes the 24th and 25th of april. After some time of thought about that memorable weekend, I just wanted to thank you for the very motivating honor you granted me during that exchange. Looking forward to our next encounter, I happily continue to appreciate the insights and knowledge you so generously offer in your teachings and writings. Thank you Shiro Kuma for the time you spent talking with me. I couldn’t make it to the kukishin bo seminar because of my bad knee. However the light you have thrown on martial arts in the brief time we were together has given me a lot to chew on. I will recover fully and be back because you have made me hungry for more. Thank you very much. Thank You Shihan Shiro Kuma, one of the best and simpliest articles that was written about that subject, thought and movement, two unseparable units which are making ninjutsu to be an art of living. The Bujinkan system is leaded by Sôke Hatsumi Masaaki in Japan and regroups 9 old martial systems (ryû) going back through centuries to the early times of warfare in Japan. The main aspect of fighting developed in Japan during the Muromachi period that preceded the famous Edo period where warfare was not allowed anymore. Everything we know about the samurai and the ninja come from this recent period of japanese history. What we train in our dôjô took place a hundred years before the peace time. Arnauld, felicitaciones por tu Blog !!! Gracias a ti Christian! Me voy manana para Japon tratare escribir en mi blog mis impresiones despues de cada clase con sensei. Le bonjour d’un ancien pratiquant que vous n’avez pas vu depuis longtemps (une décennie ? ), mais qui pense à vous assez souvent. “Vous” dans le sens de vous tous, yudansha et shidoshi. – Félicitations pour ton blog que je ne connaissais pas encore (heureusement que je connais ton surnom depuis les années 80). je penserai à vous au moment du Taikai. Amitiés à Hatsumi Sensei. NONO: I remembered I gave you this nickname of “white bear”… Why don’t you? To say that’s come from Hatsumi is looking better isn’t it? Heureux de savoir que tu lis mes posts. Pour “Shiro Kuma” tu m’avais dit que c’était le nom qu’avait donné Hatsumi Sensei quand il avait vu les photos de misogi dans la rivière dans le Vercors. Depuis 1990, soit 22 ans, c’est comme cela qu’il m’appelle en cours.